This post is part of The Claude Rains Blogathon, hosted by The Pure Entertainment Preservation Society. Read the rest of the posts in this event HERE! We tend to believe Hollywood’s attempts to strike lightning more than once by reuniting actors/directors in a new film project a recent phenomenon. Truth is, Hollywood has been doing it probably since the early history of the industry. The 1942 film Now, Voyager, starring Bette Davis, Paul Henreid, Claude Rains and directed by Irving Rapper was a huge success. With the intention of repeating that success, they were all reunited for the 1946 film Deception. It did not work out quite the way the studio hoped. However, the film’s reputation has grown over the years, and it’s not hard to see why. Based on a play called Monsieur Lamberthier by Louis Verneuil, it had various Broadway and film variations before the 1946 version. Set in the world of classical musicians, it concerns Christine Radcliffe (Davis) a talented pianist who had a passionate love affair with cellist Karel Novak (Henreid) in Europe before World War II broke out. Separated by the war, Christine assumed Karel was dead when she had no luck locating him. By pure chance she finds him playing at a college concert in New York. Karel and Christine decide to marry almost immediately, but Karel can’t help but notice a few things about her are a bit off. She lives in a stunning, well-furnished studio and has fur coats and expensive clothes hanging in her closet. Christine makes up excuses for her apparent wealth in contrast with her supposed poverty as a struggling musician. Alexander Hellonius (Rains), a brilliant and famous composer/conductor, crashes their wedding reception. It is obvious that he and Christine were having an affair—and that Hellonius was subsidizing her lifestyle—before Karel’s sudden reappearance. Christine begs Hellonius to keep her secret. The jealous Hellonius nevertheless presents Karel with the composition of a cello concerto. Christine is certain he means to sabotage Karel’s career. Her desperation to save Karel’s career and keep her past a secret lead to tragedy. This melding of styles, along with the score by Erich Wolfgang Korngold (he also composed the beautiful cello concerto Karel plays in the film) are some of the reasons why the film is better regarded today than during its time. The other thing that makes the film’s reputation is Rains’ off-the-charts performance as the arrogant, brilliant, and subtly sadistic Hellonius. At a dinner before Karel is to audition for him, he takes an absurd (and hilarious) amount of time giving the order, changing his mind over and over, and continually adding more courses. He is never explicit about his intentions, which cause both Christine and Karel to suspect him and each other. While she had great respect for Rains, Davis was supposedly threatened by the possibility that he would steal the movie from her. Deception is considered by many critics one of her weaker performances, almost a parody of her style of acting. I enjoy the melodramatic acting style of both actors, and find it appropriate for characters who are high-strung artists. Today many viewers may find the story a tad on the old-fashioned side (oh, no, she had an affair when she thought the man she loved was dead!) but the style of the film, the gorgeous music, and the superlative performance by Rains all make it a very worthwhile viewing experience. There are not that many actors, living or dead, who can pull off menacing while stroking a cat. I understand your mother’s anxiety watching this film. During the restaurant scene alone it is all I can do to keep from screaming at Hollenius. That Claude Rains is a dandy! I love Claude Rains in this film – Bette Davis was right to be worried about his stealing the movie from her. Thanks for a thoughtful and well-written blog on what I think is a good film (if not as good as some of the other Davis entries during this period). I love Bette’s high octane performance in this, and I actually think that Paul Henreid’s is better than in Now Voyager. BTW, Bette was pregnant with her daughter while making Deception and the crew’s nick-name for the film became Conception. Catch my Queen of the Lot blog at: maxmcmanus.com. 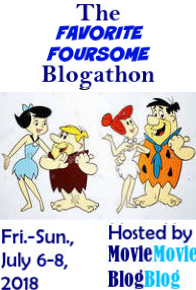 Previous Previous post: The Greatest Film I’ve Never Seen Blogathon Starts Soon! Next Next post: The Greatest Film I’ve Never Seen Blogathon Begins Tomorrow!